"Dzungar" is a compound of the Mongolian word jegün (züün), meaning "left" or "east" and γar meaning "hand" or "wing". The region of Dzungaria derives its name from this confederation. 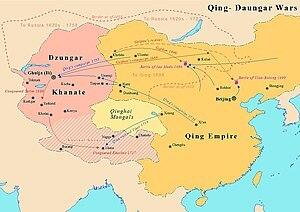 Although the Dzungars were located west of the Eastern Mongols, the derivation of their name has been attributed to the fact that they represented the left wing of the Oirats. In the early 17th century, the head of the Oirat confederation was the leader of the Khoshut, Gushi Khan. When Gushi Khan decided to invade Tibet to replace the local Tsangpa Khan in favor of the Tibetan Geluk Sect, the Oirat army were organized into left and right wing. The right wing consisting of Khoshuts and Torguts remained in Tibet while the Choros and Khoid of the Left wing retreated north into the Tarim basin, since then the powerful empire of the Choros became known as the Left Wing, i.e. Zuungar. The Dzungar Khanate is memorable because it was the last of the steppe nomadic empires and because of its influence on the westward expansion of the Chinese state. About 1620 the Oirats or western Mongols became united in Dzungaria. By about 1680 they had conquered the Tarim Basin to the south. In 1688 Galdan defeated the Khalkhas or eastern Mongols, many of whom fled southeast to Inner Mongolia where they became and remained Manchu subjects. In 1696, the Manchu defeated Galdan near Ulan Bator, chased him westward and gained control over Outer Mongolia. In 1717 Tsewang Rabtan sent an army to Tibet. The Manchu drove the Dzungars out and established a protectorate over Tibet. From 1750 to 1757, the Manchu took advantage of a Dzungar civil war to conquer Dzungaria and killed a large part of the population. The Manchu turned south and annexed the Tarim Basin by 1759, thus completing the current western border of China. The chiefs of the Dzungars were of the Choros lineage and reckoned their descent from the Oirat taishis Toghoon (d. 1438) and Esen (r. 1438–54). At the beginning of the 17th century, a young leader named Khara Khula emerged to unite the Oirats to fight Sholui Ubasi Khong Tayiji, the first Altan Khan of the Khalkha, who few years earlier expelled the Oirats from their home in the Kobdo region in present-day northwest Mongolia. Early in his reign, Khara Kula united the Choros, Dorbod and Khoid tribes, thus forming the Dzungar nation. In the 1620s wars against the Khalkha, he could gain decisive victory over the Eastern Mongols. The Oirats homeland was under the dominion of Jasaghtu Khan of the Khalkha. In 1623 the Oirat confederation killed Ubashi Khong Tayiji, and secured their independence. At the time, only Torobaikhu, a leader of the Khoshud tribe could claim the title of Khan while Baatur Dalai Taishi of the Dorbods was considered the most powerful Oirat chief. Even so, Khara Khula's son Baatur Khung Taiji (d. 1653) joined the 1636–42 expedition to Tibet led by Güshi Khan Torobaikhu. After Baatur returned to Dzungaria with the title Erdeni (given by the Dalai Lama) and much booty, he made three expeditions against the Kazakhs. With the migrations of the Torghuds, the Khoshuds and the Dorbods from 1630 to 1677, the Dzungars' relative power was increased in Zungaria. The conflicts by the Dzungars are remembered in a Kazakh ballad Elim-ai. The Dzungars went to war against the Kyrgyz, Tajiks, Uzbeks, and Kazakhs when the Dzungars invaded deep into Central Asia to Yasi (Turkestan) and Tashkent in 1643 under Ba'atur Khongtaiji. In 1653 Sengge succeeded his father Baatur Khung Taiji as Dzungarian chief, but an internal strife with his half brother Chechen Tayiji involved the Khoshuud. From 1657 on, Amin-Dara's sons Sengge and Galdan faced disafection from their half-brothers. With the support of Ochirtu Khan of the Khoshuud, this strife ended with Sengge's victory in 1661. In 1667 he captured Erinchin Lobsang Tayiji, the third and last Altan Khan. However, he himself was assassinated by his half-brothers Chechen Tayiji and Zotov in a coup in 1670. Sengge's younger brother Galdan immediately returned from Tibet to lay life and took revenge on Chechen. As a Buddhist priest, Galdan had been to Tibet at the age of thirteen and had trained under the fourth Panchen Lama and then the Fifth Dalai Lama. Allied with Ochirtu Sechen of the Khoshuud, Galdan defeated Chechen, and drove Zotov out of Zungaria. However, Sengge's two sons Sonom Rabdan and Tsewang Rabtan revolted against him, but they were also crushed in the end. In 1671 The Dalai Lama bestowed the title of Khan on Galdan. Although, already married Anu-Dara, granddaughter of Ochirtu, he came into conflict with his grandfather in law. Fearing of Galdan's popularity, Ochirtu supported his uncle and rival Choqur Ubashi who refused to recognize Galdan's title. The victory over Ochirtu in 1677 resulted in the establishment of hegemony over the Oirats. In the next year the Dalai Lama gave the highest title of Boshoghtu (or Boshughtu) Khan to him, Galdan thus united the entire Oirats in Zungaria and Western Mongolia. Brigitta Scherzenfeldt and Johan Gustaf Renat spent time in the Dzungar Khanate as prisoners of war. The Naqshbandi Sufi Khojas had replaced the Chagatayid Khans as the ruling authority of the Tarim Basin in the early 17th century. They defeated the White Mountain. [clarification needed] The exiled ruler Afaq of the White Mountain asked the 5th Dalai Lama for military assistance in 1677. By the request of the latter, Galdan initiated the Dzungar conquest of Altishahr and conquered the Tarim Basin (Altishahr), installing Afaq as his client ruler there. Galdan decreed that the Turkestanis would be judged by their own law except in cases affecting the Dzungar Empire. The Dzungars kept control over the Tarim Basin until 1757. In 1680 the Black Khirgiz raided Moghulistan and occupied Yarkend. The inhabitants of Yarkend appealed to Galdan Khan for help. The Dzungars conquered Kashgar and Yarkend, and Galdan had its ruler chosen by its inhabitants. Then he invaded the north of Tengeri Mountain in modern Kazakhstan the next year, but failed to take Sairam city. Eventually, he could conquer Turfan and Hami the next year. In 1683 Galdan's armies under Rabtan reached Tashkent and the Syr Darya and crushed two armies of the Kazakhs. After that Galdan subjugated the Black Khirgiz and ravaged the Fergana Valley. From 1685 Galdan's forces aggressively pushed the Kazakhs. His general Rabtan took Taraz city, and his main force forced the Kazakhs to immigrate westwards. In 1698 Galdan's successor Tsewang Rabtan reached Tengiz lake and Turkestan, and the Dzungars controlled Zhei-Su Tashkent until 1745. The Dzungars' war on the Kazakhs pushed them into seeking aid from Russia. The Dzungar Khanate extracted yasaq (tribute) from their Baraba Muslim underlings. Converting to Orthodox Christianity and becoming Russian subjects was a tactic by the Baraba to find an excuse not to pay yasaq to the Dzungars. The Yenisei Kirghiz (Khakas people) were made to pay tribute in a treaty concluded between the Dzungars and Russians in 1635. The Dzungar Oirat Kalmyks coerced the Yenisei Kirghiz into submission. Some of the Yenisei Kirghiz were relocated into the Dzungar Khanate by the Dzungars, and then the Qing moved them from Dzungaria to northeastern China in 1761, where they became known as the Fuyu Kyrgyz. Sibe Bannermen were stationed in Dzungaria while Northeastern China (Manchuria) was where some of the remaining Öelet Oirats were deported to. The Nonni basin was where Oirat Öelet deportees were settled. The Yenisei Kirghiz were deported along with the Öelet. Chinese and Oirat replaced Oirat and Kirghiz during Manchukuo as the dual languages of the Nonni-based Yenisei Kirghiz. At first the Khalkhas and Oirats were in league, bound by the provisions of the Mongol-Oirat code. In order to cement this union, Galdan attempted to ally with Zasaghtu Khan Shira who lost part of his subjects to Tushiyetu Khan Chakhundorji, and moved his ordo near the Altai Range. Tushiyetu Khan attacked the right wing of the Khalkhas and killed Shira in 1687. Galdan dispatched troops under his younger brother Dorji-jav against the Tushiyetu Khan the next year, but they were eventually defeated and Dorji-jav was killed in the ensuing battle. Chakhundorji murdered Degdeehei Mergen Ahai of the Zasaghtu Khan who was on the way to Galdan. The Qing court intervened and called off the Mongolian aristocrats to assemble a conference. To avenge the death of his brother and expand his influence over other Mongol areas, Galdan strategically prepared for a war with Khalkha. Galdan established a friendly relationship with the Russians who were at war with Tushiyetu Khan over territories near Lake Baikal in northern Khalkha. Bonded by a common interest in defeating Khalkha, both Galdan and the Russians simultaneously attacked Khalkha and conquered most of the territories of Khalkha. Armed with superior firearms bought from Russians, Galdan attacked the land of the late Zasaghtu Khan, and advanced to the dominion of Chakhundorji. The Russian Cossacks, meanwhile, attacked and defeated Khalkha's contingent of 10,000 near Lake Baikal. After two bloody battles with the Dzungars near Erdene Zuu Monastery and Tomor, Chakhundorji and his son Galdandorji fled to the Ongi River. The Dzungars occupied the Khalkha homeland, and forced the Jebtsundamba Khutuktu Zanabazar to flee. The Qing court strengthened its northern border garrisons, and advised the Khalkhas to resist Galdan. After being reinforced by fresh troops, the Tushiyetu Khan Chakhundorji counterattacked the Dzungars, and fought with them near Olgoi Lake on August 3, 1688. The Oirats won after a three-day battle. Galdan's conquest of Khalkha Mongolia made Zanabazar and Chakhundorji submit to the Qing dynasty in September of the same year. By his victory in 1688, Galdan had driven the Khalkhas into the arms of the Qing and made himself a military threat to the Manchus. Unfortunately for Galdan, Kangxi was unusually vigorous and warlike. In 1690 the Manchus and Dzungars fought at Ulan Butung and Galdan withdrew to the north. (The battle was fought 350 kilometers directly north of Peking near the western headwaters of the Liao River at the southern end of the Greater Khingan Mountains). The problem with all of these nomad wars was that the Manchu could not maintain a permanent army on the steppe. If the Manchu sent an army the nomads would flee and come back when the Manchu ran out of supplies. In 1696 Galdan was on the upper Kerulen River east of Ulaanbaatar about 700 km northwest of Peking. Kangxi's plan was to personally lead an army northwest to Galdan while sending a second army north from the Ordos Region to block his escape. Kangxi reached the Kerulen, found Galdan gone and was forced to turn back due to lack of supplies. On the same day that Kangxi turned back (June 12) Galdan blundered into the western army and was disastrously defeated in the battle of Jao Modo near the upper Tuul River east of Ulan Bator at Zuunmod. Galdan's wife, Anu, was killed and the Manchus captured 20,000 cattle and 40,000 sheep. Galdan fled with his remaining 40 or 50 men. He gathered a few thousand followers who later deserted due to hunger. In 1697 he was in the Altai Mountains near Khovd with 300 men when he died suddenly under mysterious circumstances (April 4, 1697). He was succeeded by Tsewang Rabtan who had revolted against him. The Dzungars led by Tsewang Rabtan's brother Tseren Dondup invaded Tibet—which was then dominated by the Khoshut Khanate founded by the Khoshuts, another Oirat tribe—in 1717, deposed Yeshe Gyatso, a pretender to the position of the Dalai Lama (who had been promoted by Lha-bzang Khan, the titular King of Tibet). The 5th Dalai Lama had encouraged Mongolian lamas to prevent any non-Ge-lugs-pa teaching among the Mongols. The Dzungars soon began to loot Lhasa, thus losing initial Tibetan goodwill towards them. The Qing Kangxi Emperor retaliated in 1718, but his military expedition was annihilated by the Dzungars in the Battle of the Salween River, not far from Lhasa. Many Nyingmapa and Bonpos were executed and Tibetans visiting Dzungar officials were forced to stick their tongues out so the Dzungars could tell if the person recited constant mantras (which was said to make the tongue black or brown). This allowed them to pick the Nyingmapa and Bonpos, who recited many magic-mantras. This habit of sticking one's tongue out as a mark of respect on greeting someone has remained a Tibetan custom until recent times. A second and larger expedition sent by Kangxi expelled Tsewang Rabtan's force from Tibet in 1720 and the troops were hailed as liberators. They brought Kälzang Gyatso with them from Kumbum to Lhasa and he was installed as the 7th Dalai Lama in 1721. At the death of Galdan Tseren in 1745 the Dzungars appeared still strong. However, the sudden collapse of the Khanate stemmed from Galdan Tseren's sons. In 1749 Galden Tseren's son Lamdarjaa seized the throne from his younger brother. He was overthrown by his cousin Dawaachi [zh] and the Khoid noble Amursana. But they began to fight each other for succession. In 1753 Dawaachi's three relatives ruling the Dorbed and Bayad surrendered to the Qing after their conflict with Dawaachi, and migrated to Khalkha. Amursana of Khoid followed them. In spring 1755, the Qing dynasty attacked Kulja leading to the capture of the Dzungar Khan, who was handed over by the Uqturpan County Beg Khojis (霍集斯). Amarsana requested that he be made Dzungar Khan, but the Qianlong Emperor would only make him Khan of Khoit, one among four equal Khans. In summer, Amursana along with Chingünjav led a revolt against the Qing. Over the next two years, the Manchu and Mongol armies of the Qing Dynasty destroyed the remnants of the Dzungar khanate. Their last leader, Prince Amursana revolted against the Qing, and fled north to seek refuge with the Russians. Amursana died there of smallpox. In the spring of 1762 his frozen body was brought to Kyakhta for the Manchu to see. The Russians then buried it, refusing the Manchu request that it be handed over for posthumous punishment. To commemorate his military victory, Qianlong established the Puning Temple Complex of Chengde in 1755. The Qianlong Emperor then ordered genocide against the Dzungars and moved the remaining Dzungar people to the mainland while at the same time ordering his generals to kill all the men in Barköl or Suzhou. Qianlong divided their wives and children amongst the Qing forces, which consisted of Manchu Bannermen. Qing scholar Wei Yuan estimated the total population of Dzungars before the fall at 600,000 people, or 200,000 households. Oirat officer Saaral betrayed and battled against the Oirats. In a widely cited account of the war, Wei Yuan wrote that about 40% of the Dzungar households were killed by smallpox, 20% fled to Russia or Kazakh tribes, and 30% were killed by the Qing army of the Manchu Bannermen, leaving no yurts in an area of several thousands li except of those who had surrendered. During this war Kazakhs attacked dispersed Oirats and Altays. Based on this account, Wen-Djang Chu wrote that 80% of the 600,000 or more Dzungars (especially Choros, Olot, Khoid, Baatud and Zakhchin) were destroyed by disease and attack which Michael Clarke described as "the complete destruction of not only the Dzungar state but of the Dzungars as a people." Historian Peter Perdue attributed the decimation of the Dzungars to an explicit policy of extermination launched by Qianlong, but he also observed signs of a more lenient policy after mid-1757. Mark Levene, a historian whose recent research interests focus on genocide, has stated that the extermination of the Dzungars was "arguably the eighteenth century genocide par excellence." It was not until generations later that Dzungaria rebounded from the destruction and near liquidation of the Dzungars after the mass slayings of Dzungars. Anti-Dzungar Uyghur rebels from the Turfan and Hami oases had submitted to Qing rule as vassals and requested Qing help for overthrowing Dzungar rule. Uyghur leaders like Emin Khoja were granted titles within the Qing nobility, and these Uyghurs helped supply the Qing military forces during the anti-Dzungar campaign. The Qing employed Khoja Emin in its campaign against the Dzungars and used him as an intermediary with Muslims from the Tarim Basin to inform them that the Qing were only aiming to kill Oirats and that they would leave the Muslims alone, and also to convince them to kill the Oirats themselves and side with the Qing since the Qing noted the Muslims' resentment of their former experience under Dzungar rule at the hands of Tsewang Rabtan. There were 600,000 Khalkha Mongols and 1,000,000 Oirats in 1755. According to 2010 estimate 2,500,000 Khalkhas and 520,000 Oirats living in four countries. There were a few hundreds of Choros people in Mongolia. The Qing "final solution" of genocide to solve the problem of the Dzungars, made the Manchu Qing sponsored settlement of millions of Han Chinese, Hui, Turkestani Oasis people (Uyghurs) and Manchu Bannermen in Dzungaria possible, since the land was now devoid of Dzungars. Professor Stanley W. Toops noted that today's demographic situation is similar to that of the early Qing period in Xinjiang. In northern Xinjiang, the Qing brought in Han, Hui, Uyghur, Xibe, and Kazakh colonists after they exterminated the Oirats in the region, with one third of Xinjiang's total population consisting of Hui and Han in the northern area, while around two thirds were Uyghurs in southern Xinjiang's Tarim Basin. In Dzungaria, the Qing established new cities like Ürümqi and Yining. The Qing were the ones who unified Xinjiang and changed its demographic situation. The Dzungarian basin, which used to be inhabited by Dzungars, is currently inhabited by Kazakhs. The Dzungar genocide has been compared to the Qing extermination of the Jinchuan Tibetan people in 1776. The depopulation of northern Xinjiang after the Buddhist Oirats were slaughtered, led to the Qing settling Manchu, Sibo (Xibe), Daurs, Solons, Han Chinese, Hui Muslims, and Turkic Muslim Taranchis in the north, with Han Chinese and Hui migrants making up the greatest number of settlers. Since it was the crushing of the Buddhist Oirats by the Qing which led to promotion of Islam and the empowerment of the Muslim Begs in southern Xinjiang, and migration of Muslim Taranchis to northern Xinjiang, it was proposed by Henry Schwarz that "the Qing victory was, in a certain sense, a victory for Islam". Xinjiang was a unified defined geographic identity was created and developed by the Qing. It was the Qing who led to Turkic Muslim power in the region increasing since the Mongol power was crushed by the Qing while Turkic Muslim culture and identity was tolerated or even promoted by the Qing. After the Qing were done conquering Dzungaria in 1759, they proclaimed that the new land which formerly belonged to the Dzungars, was now absorbed into "China" (Dulimbai Gurun) in a Manchu-language memorial. The Qing expounded on their ideology that they were bringing together the "outer" non-Han Chinese like the Inner Mongols, Eastern Mongols, Oirat Mongols, and Tibetans together with the "inner" Han Chinese, into "one family" united in the Qing state, showing that the diverse subjects of the Qing were all part of one family, the Qing used the phrase "Zhong Wai Yi Jia" (中外一家) or "Nei Wai Yi Jia" (內外一家, "interior and exterior as one family"), to convey this idea of "unification" of the different peoples. The massacre of Oroi-Jalatu, 1756. Manchu general Zhao Hui attacked the Dzungars at night in present Wusu. ‡ Note: Although Amursana had de facto control of some areas of Dzungaria during 1755–1756, he could never officially become Khan due to the inferior rank of his clan, the Khoid. ^ Ethnic Groups of North, East, and Central Asia: An Encyclopedia, by James B. Minahan, p. 210. ^ For the Mongols the primary direction was south. Gaunt, John (2004). Modern Mongolian: A Course-Book. London: RoutledgeCurzon. p. 165. ISBN 978-0-7007-1326-4. Mongolian maps placed the south at the top, so west was to the right and east was to the left. Akira, Kamimura. "A Preliminary Analysis of Old Mongolian Manuscript Maps: Towards an Understanding of the Mongols' Perception of the Landscape" (PDF). ^ Genina, Anna (2015). Claiming Ancestral Homelandsː Mongolian Kazakh migration in Inner Asia (PDF) (A dissertation submitted in partial fulfillment of the requirements for the degree of Doctor of Philosophy (Anthropology) in The University of Michigan). p. 113. ^ Ahmad Hasan Dani; Vadim Mikhaĭlovich Masson; UNESCO (1 January 2003). History of Civilizations of Central Asia: Development in contrast: from the sixteenth to the mid-nineteenth century. UNESCO. pp. 116–. ISBN 978-92-3-103876-1. ^ C. P. Atwood ibid, p. 622. ^ Ariel Cohen (1998). Russian Imperialism: Development and Crisis. Greenwood Publishing Group. pp. 50–. ISBN 978-0-275-96481-8. ^ Frank, Allen J. (1 April 2000). "Varieties of Islamization in Inner Asia The case of the Baraba Tatars, 1740–1917". Cahiers du monde russe. Éditions de l’EHESS: 252–254. doi:10.4000/monderusse.46. ISBN 2-7132-1361-4. ISSN 1777-5388. ^ Millward 2007, p. 89. ^ Concise Encyclopedia of Languages of the World. Elsevier. 6 April 2010. pp. 611–. ISBN 978-0-08-087775-4. ^ E. K. Brown; R. E. Asher; J. M. Y. Simpson (2006). Encyclopedia of language & linguistics. Elsevier. p. 224. ISBN 978-0-08-044299-0. ^ Tchoroev (Chorotegin) 2003, p. 110. ^ Pozzi & Janhunen & Weiers 2006, p. 113. ^ Juha Janhunen (1996). Manchuria: An Ethnic History. Finno-Ugrian Society. p. 112. ISBN 978-951-9403-84-7. ^ Juha Janhunen (1996). Manchuria: An Ethnic History. Finno-Ugrian Society. pp. 111–112. ISBN 978-951-9403-84-7. ^ Juha Janhunen (1996). Manchuria: An Ethnic History. Finno-Ugrian Society. p. 59. ISBN 978-951-9403-84-7. ^ Norbu, Namkhai. (1980). "Bon and Bonpos". Tibetan Review, December, 1980, p. 8. ^ Chu, Wen-Djang (1966). The Moslem Rebellion in Northwest China 1862-1878. Mouton & co. p. 1. ^ "Michael Edmund Clarke, ''In the Eye of Power'' (doctoral thesis), Brisbane 2004, p37" (PDF). Archived from the original (PDF) on 10 April 2008. Retrieved 19 February 2013. ^ Perdue 2009, p. 285. Zhao, Gang (January 2006). "Reinventing China Imperial Qing Ideology and the Rise of Modern Chinese National Identity in the Early Twentieth Century" (PDF). Modern China. Sage Publications. 32 (Number 1): 3. doi:10.1177/0097700405282349. JSTOR 20062627. Archived from the original on 25 March 2014. Retrieved 17 April 2014. Хойт С.К. Этническая история ойратских групп. Элиста, 2015. 199 с.